The bouquet toss was one best moments of this Barcelo Maya Palace Deluxe wedding day. This album spread is composed of two photos placed in reversed chronological order. 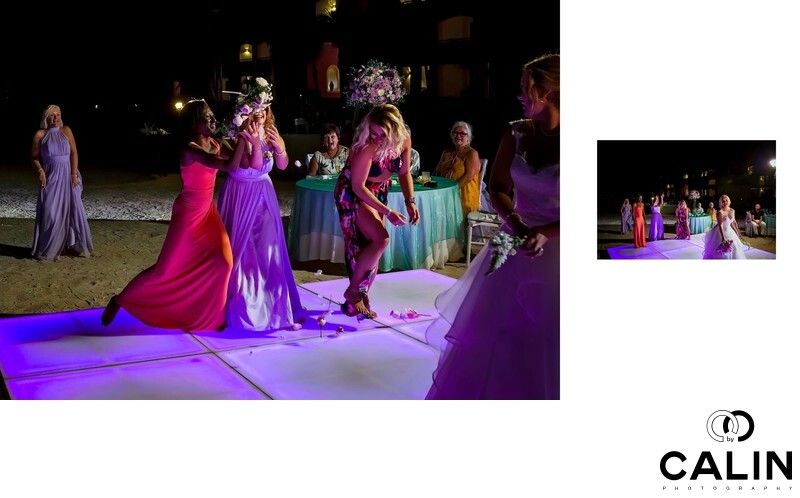 The photo on the left shows the exact moment when the single ladies jumped to catch the bouquet. There are a few things I love in this image, and they make it special. First, this wedding picture freezes a moment in time and captures the ladies expressions and movement. Also, we can see the guests' reactions in the background. The image on the right captures the exact scene seconds before the bride tossed the bouquet. It is a candid photo that captures everybody's reactions in anticipation of the big moment. What makes this album spread special? First, both images have three layers or three stories if you wish. First, the bride is in the foreground, and we can see her reactions. Second, about's 15 feet behind the bride we see the single ladies clapping and laughing waiting for the bouquet. Third, in the background begin to see the guests screaming, laughing and obviously enjoying the moment. Finally, in the background, we can see the resort and someone's silhouette watching the moment. Generally, it is tough to capture multiple stories in one shot. However, through proper planning and sheer luck, I was able to create these gorgeous images.